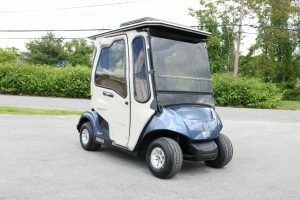 West Boylston, Massachusetts, April 19, 2018 – Curtis Industries, LLC today announced the release of a compact air conditioning system for the Yamaha Drive and Yamaha Drive2 golf cars. The system uses patent-pending “dynamic load control” software to precisely manage the vehicle electrical power, allowing the unit to operate on smaller vehicles with lower horsepower. The Curtis air conditioner is an industry first. It is a true automotive quality air conditioner, not an evaporator cooling system. Unlike evaporator systems which have limited cooling capacity, the Curtis air conditioner provides cooling comfort, improved air quality and humidity control in any climate. By using standard automotive grade components with tube and fin evaporator, the system increases the outside surface to improve the heat transfer rate. The refrigerant components are completely contained within the roof-top unit and shipped from the factory fully charged with R134a refrigerant, minimizing installation time and complexity. The air conditioning unit features a stylish, low-profile design that is incorporated into an aluminum replacement roof. A power kit with auxiliary alternator is included. The power kit mounts to the engine starter generator. A custom overhead console features 3-speed fan control, illuminated on/off switch and four adjustable louvers to circulate air throughout the cab. The console also contains a ‘boost’ button allowing the operator to disengage the air conditioning compressor for blower only air circulation. The unit features fully self-contained refrigeration components pre-charged with refrigerant. Installation takes about two hours and does not require specialized knowledge or training in air conditioning installation or maintenance.